Drawing a line between professional and personal these days is easier said than done. The lines between work life and real life sometimes feel non-existent. At any given moment, an in-office meeting can be changed to an out-of-office gathering and before we know it, work hours have now turned into after hours. We are not only expected to adapt at any given moment to schedule changes but to our style as well. So, what better way to transition between all of these scenarios than with the most transitional pair of pants? We’re certain these pants are so perfect, it’ll feel as if they were individually tailored for all of those unexpected-yet-expected situations. 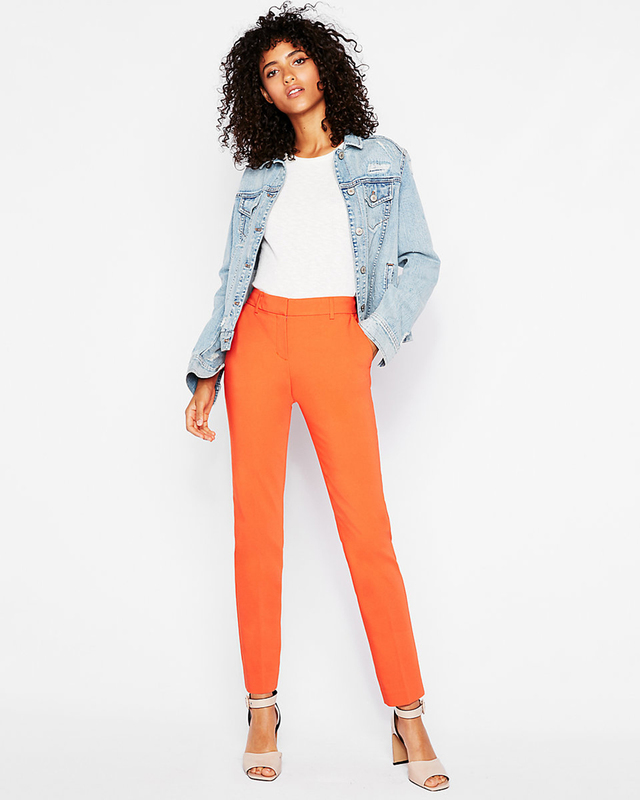 See it: Grab a pair of the Mid Rise Ankle Columnist Pant for $80 and get a second for half off while this BOGO 50% off offer lasts at Express! The Mid Rise Ankle Columnist Pant is the one and only stylish staple that adds structure back into our wardrobes. The super slimming silhouette is ultra-flattering that can (and will) survive any functions whether work-related or just for fun. No, it’s not just Us who can’t stop obsessing over these pants because nearly 500 reviewers can’t stop singing their praises either. The columnist pants are not just super cute to look at, they are also super cute to wear. Reviewers cannot stop claiming just how perfect these one-of-a-kind pants truly are. One specific reviewer could not stop raving about the endless compliments she received. The columnist pants go above and beyond featuring 11 universally flattering shades for shoppers to choose from which include pink, hot pink, light blue, orange, redwood, true white, pitch black, bright pink, deep teal, red and dark blue. We aren’t the only ones in awe over how endless the shades are, reviewers were so happy with the variety, too. One reviewer detailed her previous experience (and struggles) when searching for a pair that was not just flattering, but available in more than one color. The reviewer was pleasantly surprised to find this wardrobe-saving staple! Most of the colors are a year-round staple, as the reviewer noted, so there’s truly something for everyone at any time and anywhere! Forget about the little black dress, the columnist pant offers the LBP, the little black pant. These anything-but-basic pants are ideal when going from day-to-night as they can be elevated instantly. Dress them down with a white tee and knee-length cardigan for office hours. Trade in the T-shirt for a silky smooth cami or a sheer blouse for after hours. Elevate the ensemble with a pair of black booties and sleek leather jacket. Oh-so-chic! Not looking for a little black pair? Follow suit as one reviewer did and go ahead and buy three bold and bright colors to spring into the warmer seasons with! We only wish we thought of this advice first. What’s hotter than red? Nothing! The ultra-flattering red shade will go the distance. We’d highly recommend warming up any wardrobe with these red hot pants that can spice up any closet. Pair these bold pants with a silk cami and top it off with matching red blazer. How fabulous is too fabulous? In this coordinating set, the limit does not exist! Another fan-favorite shade? The true white. It’s a less traditional and more trendsetting approach to the outdated white jean. Why not pair with a crisp, white button-up for a monochromatic look. After all, it’s so in! Looking for more color? Opt for a chambray button-up instead. It will be equally chic! Sure, the endless shades captivated the reviewers’ attention, but it was the ultra-flattering fit that put them over the edge. So many reviewers could not stop claiming how it is as if these pants were made for them and them only. The mid-rise pant features a somewhat-stretchy waistband that gives a little extra when we need it. Across the board, reviewers cannot stop raving about this feature that went above and beyond! It’s safe to say we can go on and on about the endless reviews but don’t just take our word, take the more than 400 reviewers’ word and see just why these pants are the most perfect pants, ever. 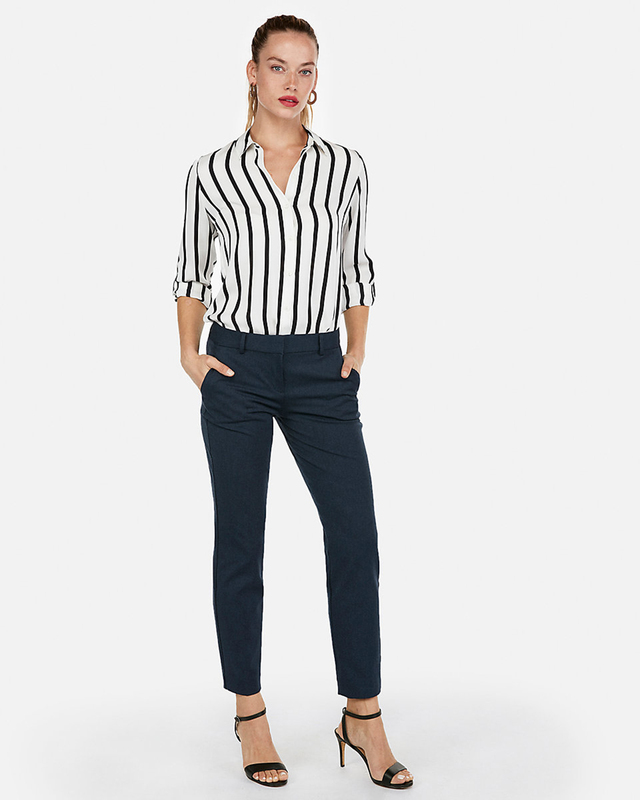 See it: Grab a pair of the Mid Rise Ankle Columnist Pant for $80 and get a second for half off while this BOGO 50% off offer lasts at Express! Not your style? Check out additional pant styles available at Express!